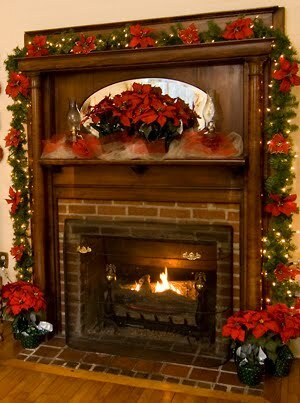 It's December 1st, and the Mountain Rose Inn is ready for Christmas!! As is our tradition here at the Inn, we had our decorating party yesterday. We are so blessed to be in a community with friends who help each other out. Each year, on the Monday after Thanksgiving, a group of friends comes to the Inn to help put up all the holiday decorations. We laugh, tell jokes, catch up on family news, listen to Christmas carols and well, work hard to get it all done. By the end of the day, the tree is up, the stairs are wrapped in garland & lights, the outside porches are decorated and the Inn takes on that happy, holiday glow. Best of all, we are refreshed from having spent a day with the good folks that we are blessed to call our friends.